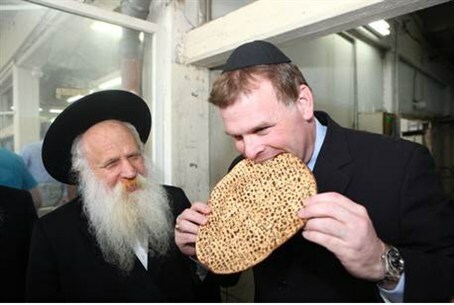 Canadian Foreign Minister John Baird munched on matzah and pressed the flesh Tuesday in a visit to Israel's Kfar Chabad village. The Chabad-Lubavitch Chassidic enclave warmly welcomed the Canadian lawmaker, who came as a guest of the Chabad Terror Victims Project. Baird met with the families of terror victims, heard their stories and wiped away tears. "This meeting was important to me, because until today I knew about the issue of terrorism only through dry reports," he said. "Now I know about the pain of terrorism borne on the faces of those who lived." The minister was accompanied by Canadian Ambassador Paul Hund, Israeli Ambassador to Canada Miriam Ziv and Chabad-Lubavitch emissary to Ottawa, Rabbi Chaim Mendelson. The entourage visited the reconstruction of the room of the late Lubavitcher Rebbe, Rabbi Menachem M. Schneerson, in the village's replica of "770" -- the headquarters of the worldwide Lubavitch Movement located in Brooklyn, New York. Baird spoke with great feeling about his initial experiences in the foreign service, and how he reacted to a report about the launching of Katyusha rocket attacks on southern Israeli towns. "What should we do?" he recalled asking his supervisor. "Turn to the United Nations? Launch a protest?" And his supervisor replied, "We do not interfere, because we don't know how to differentiate between the white and black hats." This, said Baird, made clear the "moral relativity of the world" when it comes to Israel. "I presented the paper to the supervisor, and told him, 'We can certainly differentiate between the white and black hats -- and I certainly know who I support." Also on the itinerary was a visit to the local matzah bakery, where the Canadian officials were treated to an explanation of the process and a sample of the product. Matzah baking is in full swing, since an entire world -- thousands of Chabad emissaries and the hundreds of thousands of Jews they work with and assist -- must be supplied prior to the onset of the Passover holiday, just a few months away.